Nancy Sims brings 20-plus years of professional service to the financial industry within both for-profit and non-profit organizations, including her current role as President and CEO of the Toigo Foundation for more than a decade. She is recognized nationally as a passionate advocate for diversity, uncompromising integrity, transparency, collaboration and excellence in dealing across all sectors of finance, the pension fund community, academic institutions and thousands of diverse professionals. With her groundbreaking approach to program development and delivery, Toigo has directly supported the advancement of 1,000+ minority MBAs as finance professionals and has significantly increased the brand impact of the organization, now in its 27th year of service. 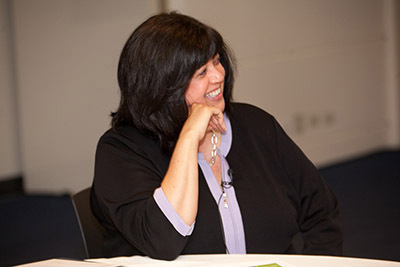 Through the recent launch of the Toigo Institute for Leadership Excellence Advancement and Diversity (I-LEAD) and other national programs, like Groundbreakers, Nancy has put forward initiatives that are designed to cultivate broader networking, career opportunities, leadership development and knowledge sharing among tens of thousands of women and minorities and the industry overall. During Nancy’s tenure, Toigo has become a vocal advocate for multicultural diversity within all levels of leadership. Via coverage in media ranging from NPR, Businessweek, and The Wall Street Journal to speaking engagement and individual firm counseling, Nancy has presented the valued perspective of Toigo to industry and government on diversity practices within finance. In 2008, she was invited to testify before a U.S. House Financial Services Oversight Committee examining diversity practices with Wall Street. At the same time, Nancy’s relationship-driven leadership style ensures that she remains close to Toigo talent—and the issues minority professionals face as they mature as leaders in the industry. Under Nancy’s leadership, Toigo has implemented a model 501(c)3 governance structure that includes engagement of a blue-chip board and operational transparency and compliance, making Toigo a standout among non-profits and mission-driven organizations. Prior to joining Toigo as its President and CEO, Nancy served as a member of the Board of Directors for five years, as a mentor to many early-stage Toigo Alumni. She served as Senior Vice President and Director of Institutional Marketing for McNeil Capital and as Vice President, Client Relations for the RREEF Funds. As Director of Human Resources at RREEF Funds, Nancy developed and launched a model program for implementing social responsibility across a range of initiatives, from minority vendor contracting to scholarships and internships. Beyond her tireless service to Toigo, Nancy is a living example of her own “build yourself as a leader” philosophy with an unwavering passion and purpose for serving youth, including her previous role as Chair of two California non-profit organizations addressing the needs of children in the foster care system, and personally as a former foster parent to two children who remain in her life today as young adults. Nancy received a dual Bachelor’s Degree in English and Administration and Legal Processes (pre-law) from Mills College.